We're both huge tea fanatics, whether we want to admit it or not. I've always loved tea, but once I turned Andrew on to it we haven't looked back. In the cooler weather, I'd average four cups a day. Now that spring is in the air I've turned to drinking it iced. DavidsTea is one of our favourite places but we always end up going over our budget! There are so many options, the staff is so friendly and their tea accessories outshine anything else. Loose leaf tea is unlike any other so I recommend you try it if you haven't! In the winter Andrew bought a teapot - the classic DavidsTea turquoise pot that had made many, many cups of tea. One of the first things we decided when we moved into our new apartment was where we'd put the teapot. We decided on the stove - front and centre. Against the shiny white appliance, it stands on it's own as a pop of colour. From there the teapot seemed to become the showcase of the kitchen and the inspiration for our colour scheme! 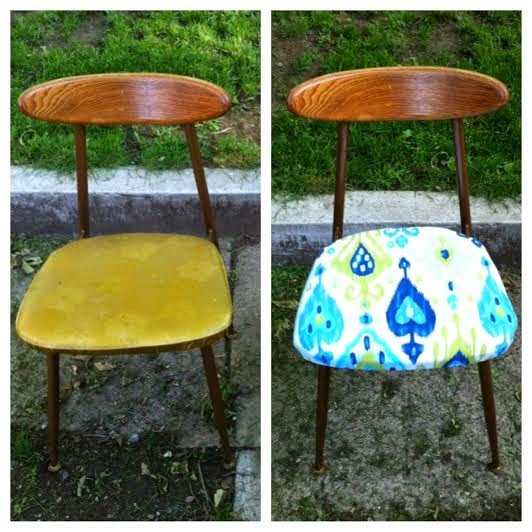 I redid the chairs for our kitchen last summer with the help of my Dad. I picked the fabric long before I had a place to live but I was fond of the colour scheme which now is very fitting for our little kitchen. The vintage chairs were recovered and re-stained to bring them up to date, but they're one of my favourite parts of our space. They were from my last apartment with my university roommates and when we moved out, no one else wanted to take them. I saw their potential and gladly volunteered to give them a home in my future apartment. recovering involved tearing off the old vinyl, repadded the base with seat foam and staple gunning the new fabric on! a simple, quick, and satisfying DIY. my dad gets all the credit for staining the backs of them a few weeks ago! 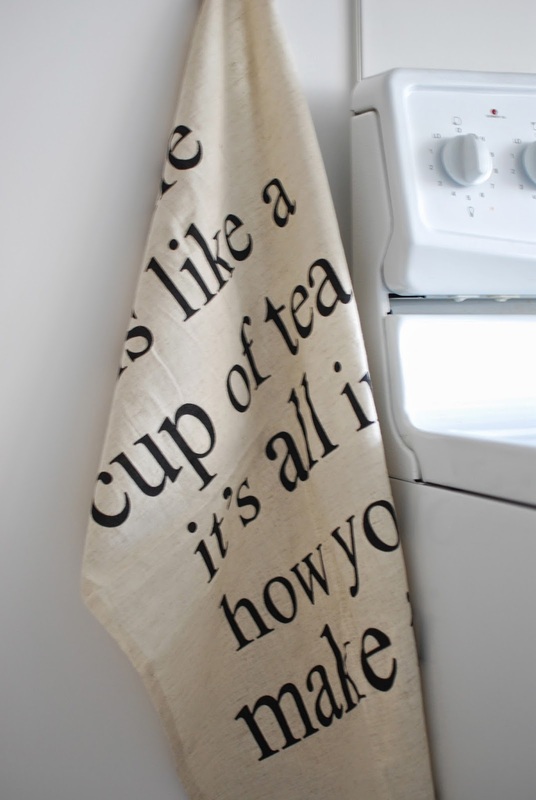 My other favourite part about our kitchen is our tea towel that could now be one of my favourite little life sayings: Life is like a cup of tea, it's all how you make it. Chapters has the sweetest home decor selection from throw pillows to mugs. Not to mention that their customer service is always exceptional. One of my favourite places to wander and their pieces scattered throughout our little space make it feel like home. Lastly come the placemats that surfaced in my Easter basket. The perfect shade of blue that matches our teapot. It's true - maybe we're addicts for herbal, fruity, floral beverages but it could be worse! placemats found at Loblaws for $3 a piece - thanks, Mom! Each room in our home has developed its own colour scheme. So far our living room is shades of grey, our kitchen is hues of blue, and our hallway is soon to be home to a beautifully eloquent gallery wall. I hope you stay tuned as we turn our first apartment into a home!